Ariane can be used to make estimates of transport through cross-sections by releasing a large number of particles and calculating how many particles pass through each section. Next, we will go through how to set up a quantitative experiment in Ariane. The namelist for quantitative mode is very similar to qualitative mode. Here is an example of a quantitative namelist. nmax: The maximum number of particles. This parameter is typically much higher in quantitative mode. key_eco: Setting to .TRUE. reduces CPU time. key_reducmem: Setting to .TRUE. reduces memory by only reading model data over selected region. key_unitm3: Setting to .TRUE. prints transport calculation in m^3/s instead of Sverdrups. max_transport: Maximum transport (in m^3/s) that should not be exceeded by the transport associated with each initial particle. A lower values means more initial particles and higher accuracy. Example values are 1e9 for one particle in one model cell and 1e4 for typical experiments. lmin: First time step to generate particles. lmax: Last time step to generate particles. key_alltracers: .TRUE. to print tracer information in diagnostics. key_computesigma: .TRUE. to compute density from temperature and salinity. You must define a closed region in your domain for transport calculations. Ariane calculates the mass transport between an initial section in your region and the other sections. Ariane provides a couple of useful tools for defining the sections. 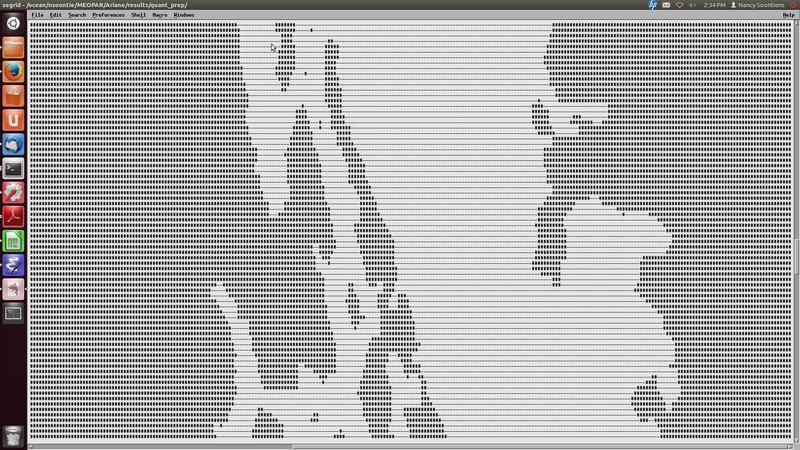 mkseg0: This program reads your land-ocean mask and writes it as a text file. Run this program in the same directory as your namelist. You may need to add the ariane executables to your path. Land points are # and ocean points are -. Add numbered sections to this file. Be sure your sections are over ocean points and not land points. Ariane will initialize particles along the section labelled as 1 and will calculate transport through all other sections. Your sections must make up a closed volume. Place the @ symbol somewhere within your closed subdomain. Your final edit might look something like this. 1   250   313  -409  -409     1    40 "1section"
2   264   312   386   386     1    40 "2section"
3     1   398     1   898     0     0 "Surface"
You can rename "1section" and "2section" to something more intuitive if you desire. You should also add a "Surface" section as above. Run ariane. Remember to check that you have added the ariane executable to your path. lost are the particles not intercepted by any section. meanders are the particles that go back out the source section. !- ADD AT THE END OF EACH LINE "! !ctr1" -! lmt and lmax should be substituted by the values you set in the namelist. You must remake and install ariane when making a change to any of the fortran files. In stats.txt, you will now see the particles intercepted by this time criterion. You can also impose a density and/or salinity and/or temperature criteria on the initial particles in order to track different water masses. You can achieve this by editing mod_criter0.f90. Once again, you must remake and install ariane. You’ll also need to make sure that key_alltracers and key_computesigma are .TRUE. and zsigma are defined in your namelist. Now particles will be initialized with salinity less than 29. There are other examples of useful criteria in mod_criter0.f90. From the initial state statistics, you can see that the particles satisfy the salinity criteria. This might not be true of the final particles. Ariane will also produce netCDF files ariane_positions_quantitative.nc and ariane_statistics_quantitative.nc that can be used to plot the particle trajectories and statistics.